A short time ago, when I was red-eyed in the dawn, discovering the musick of bygone automata, I discovered something else, something more ancient but newer at the same time. Produced by the same Rich Pell of Specific Recordings as Robotic Music of Pittsburgh, Jimmy Crouse's Not To Take Upon Oneself to Say (1991 - 2017) was something special. Hearing the strange twisty songs, all gnarled and weird, I felt like I had gone somewhere underground. And the songs were actually only from New York! Despite what it looks like, the title is not composed of birth and death dates of a person; these songs were started in 1991 and finished last year. They were recorded in one take and left unedited. Sounds good to me. The cover of Not To Take Upon Oneself to Say (1991 - 2017) is a piece of a map. To me, it looks like it shows where Antarctica would be. It's not there. This is before the discovery. This is uncharted land. This is terra incognita. When I was a child I read from an old encyclopedia tales of the extinction of the dodo, poems of the ghost of the great auk, and other stories about rocky shores on far-flung 19th century lands. Here they are. 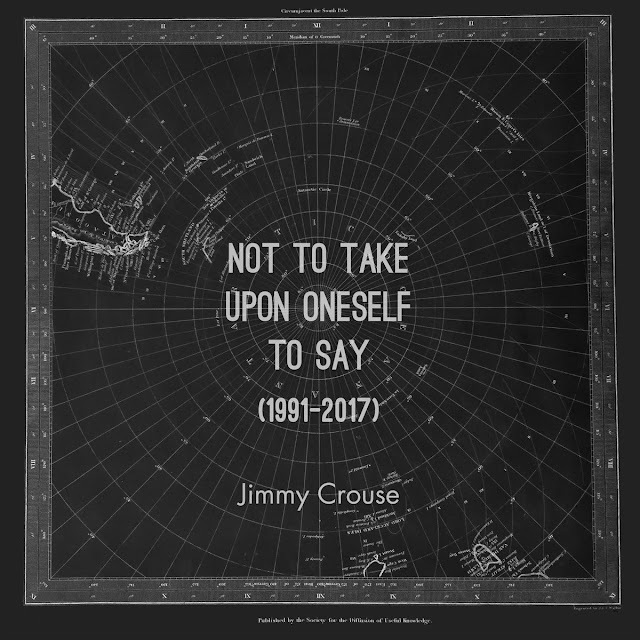 Not To Take Upon Oneself To Say (1991-2017) by Jimmy Crouse "From What One Can Gather" is the first track on Not To Take Upon Oneself To Say (1991 - 2017). It becomes more musical as it goes along, but it's good the whole way through. It's simple, barebones, just vocals and stark guitar from somewhere out on the prairie, an old log house and smoke etched in metal via acid to show to future kids. "Tell 'em all I tried." The next track is "At Any Rate", opening with some shuffling. This album is the real deal. Crouse's vocals are long and ghostly on this, a strange chant to what could be uplifting musick. Despite the minimalism, there is a lot of depth here. "Each In Its Turn" has some interesting wordplay and some old words too, words from back in those folklore days before the lithographs were made. I like the short segment of bare instrumentation at the end. The final track is "By Way Of Example". It has some more weird wordplay and long drawn-out vocals and minimal, beautiful guitar, another ghost song. I can't make out what the song means too much, but I feel like my mind opens by listening to it. It ends suddenly. Not To Take Upon Oneself To Say (1991 - 2017) is amazing. I feel like the world opened up after hearing it. I feel like there is so much more to the Earth than what I thought. Somewhere, maybe in New York City, maybe in a hole in the Appalachian Mountains, maybe somewhere far from here on another continent, there is more magick. It's everywhere, really, if you take the time to look. I love the raw sound on this album, the simple but profound nature of it, the almost grim aesthetic. It reminds me of two friends, Reid Magette combined with Dean Cercone. There's not much else like this. Not To Take Upon Oneself To Say (1991 - 2017) gets a Good.